Is there a best temperature to serve Pinot Noir wine? Temperature affects how you perceive the flavors of wine, so serving it at the appropriate temperature can enhance your enjoyment. Pinot Noir is a red wine made from the Pinot Noir grape. France's Burgundy region makes Pinot Noir wines, as do many other growing regions throughout the world such as California and Oregon. Champagne is also made from a blend of Pinot Noir grapes and Chardonnay grapes, and blanc de noir Champagne is made exclusively from Pinot Noir grapes made in the Méthode Champenoise. Pinot Noir gets its dark red color because the Pinot Noir juice, which is clear, is left in contact with the skins. Using the best temperature to serve Pinot Noir wine brings out its flavors. When Pinot Noir is served too warm or too cold, you may miss out on some of the subtler aspects of the wine. While Pinot Noir style varies from region to region, it is common to discover some of the following flavors in Pinot Noir when it is served at the appropriate temperature. Other characteristics of Pinot Noir include velvety, medium- to full-bodied, richness and softness. Pinot Noir also contains minimal acidity and moderate alcohol levels. Serving and storing Pinot Noir at the proper temperature is a delicate balance. Doing so can preserve all of the above characteristics, providing an ideal balance of fruit, alcohol, and acid while revealing the subtle nuances of the wine's flavor profile. While temperature doesn't change any of these characteristics, it can affect how your palate perceives them, so serving temperature makes a difference. As with most red wines, Pinot Noir is ideally served at slightly cooler than room temperature. It is a myth that red wines should be served at room temperature, which is too warm. Lighter bodied reds, such as Pinot Noir, are best served at about 55°F. You can store the Pinot Noir in a wine refrigerator at the same temperature, which helps the wine extend its longevity. If you store your Pinot Noir at room temperature, you can cool it to the appropriate temperature with two hours in the refrigerator, 15 minutes in the freezer, or five minutes in ice and water. Don't overcool, or you will lose the subtler aspects of the wine. One of the reasons that traditional wineglasses have stems is to help you to maintain the appropriate temperature as you drink the wine. If you hold the glass by the bowl, your hand can warm up the temperature of the wine. Instead, hold the wine by the stem. If you are using stemless glasses, don't hold the wine in your hand. Instead, only pick it up when you take a sip of wine. 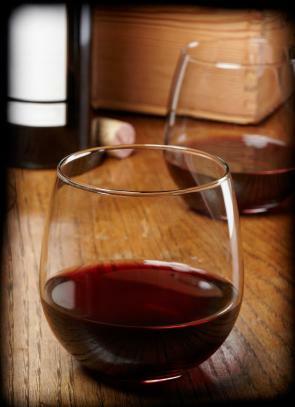 Many manufacturers, such as Reidel, make wine glasses designed especially to enhance your enjoyment of Pinot Noir. Champagne and blanc de noirs, which also contain Pinot Noir, should be served at between 43°F and 48°F. As with Pinot Noir glasses, hold Champagne glasses by the stem. How you store the wine can also affect its flavor profile. Ideally, store Pinot Noir and other wines in a temperature and humidity-controlled environment away from light and vibration. If you store wine at too warm of a temperature for extended periods of time (usually greater than 65°F), it can prematurely age the wine or cause its flavors to break down. Storing wine at too cool of temperatures can also damage the wine. The idea temperature to store red wine such as Pinot Noir is between 50 and 55°F, while you can store whites and Champagne at 45°F. Serving and storing wine at the appropriate temperature makes a big difference of your enjoyment of the wine. Pinot Noir is a beautiful wine with delicious flavors that will benefit from wine serving temperatures.